Time seems to have speeded up (must have something to do with aging), and it is now November, and most definitely fall. The long dry period has ended and all the plants and trees are happily soaking up the rain. The harvest has been abundant. David and Jeff filled several wheelbarrows full of squash. 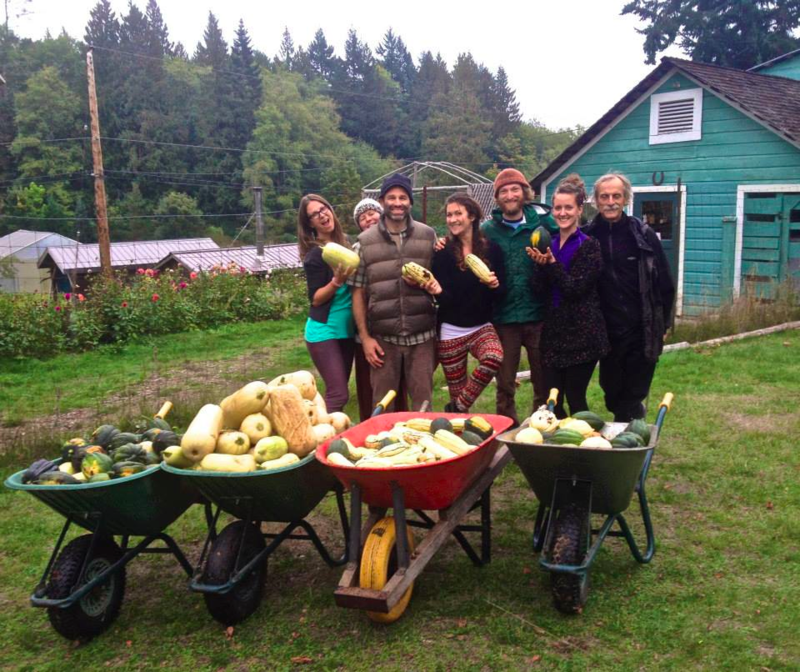 Karma Yogis Christine, Tana (behind Raven), Raven, Olivia, Jeff, Marianne, Mark and all the squash! Karma Yogi Olivia preparing stuffed peppers for dinner. As the seasons turn, change is the one constant. Early in October we said goodbye to our dear friend Ravindra (Theo Lefterys) . He had been ill for months and spent many weeks in the hospital on Salt Spring before he left his body. Click here to read Divakar’s memories of Ravindra and see photos of him from the early days – 1976. We send our love to his children, Harish (Rish), PK (Isaac) and Gita (Mikaila). Later in October we celebrated Canadian Thanksgiving with a very large gratitude circle that over-filled the satsang room, followed by an amazing vegetarian potluck. We held our second-last Yoga Getaway of the season recently – one more coming up November 7 -9. As usual, there will be a small winter residential community, with more opportunities for study and practice than during the busy program season. Two new people who first came here as YSSI participants, will join the office team, Bergen as office coordinator and Marianne as programs coordinator. We are all very happy to have them here. On Nov. 25 the Centre School will hold its annual Celebration of Light, led since the the earliest days of the school by Usha. During the evening, all the children, holding candles set into apples, walk one by one through a spiral of cedar boughs sprinkled with stars, to light their candle from the big candle in the middle. Throughout, everyone sings songs of light from many traditions. By the end of the evening, when all the candles are lit, the school’s teachers sing everyone out the door: May the longtime sun shine upon you, all love surround you, and the pure light within you guide your way home. Wish you all happy and healthy. One thought on "News from the Centre – November 2014"
I just found out I completely misspelled the name of the beautiful little girl sitting with Christine in front of the Thanksgiving altar. It’s Zailaya, not Zyleah. Oops.